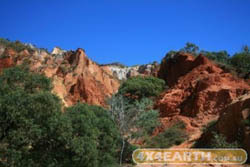 It\'s a fairly easy drive from Cooktown through Hope Vale to Elim beach to see the Colourful sands. You will need to get a permit from the fuel station in Hope Vale ( $10) for a day trip, there is also camping there and great fishing. There is a little beach driving so watch the tide, or you can park and walk the 500m to the colourful sand, take your camera and you will not be disappointed, well worth the $10 bucks.